Pai Gow is a popular casino game based on Chinese Dominoes. Due to its popularity with Asian gamblers, the game is becoming more widespread in the UK. And you can even find freeplay games at some of the best online casinos. If you're not too familiar with the game, think of it a little like poker, except there are two hands to make instead of one. Beat both the Dealer's hands and you win - it's that simple. Pai Gow is a great game to try out for free and you'll find plenty of games online in 2016. Pai Gow is a Chinese casino game traditionally played with a set of 32 dominoes. It's hugely popular at Macau casinos, but also around Australia and some London casinos. Pai Gow Poker first appeared in Californian cardrooms in the 1980s. It took on the facets of the ancient dominoes game - making sets of 'hands' or tiles - and added a poker twist. The game continued to be popular in LA casinos like the Bicycle and Commerce, as well as its nearest cousin, Super-9. Exciting variants continued to be developed, including Pai Gow Mania which allowed side bets on each hand. Emperors Challenge awards a side bet if the player's seven cards make no hand (a 'Pai Gow'). 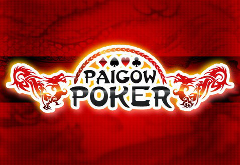 Available for free at most online casinos, Pai Gow Poker is a great game if you're already familiar with Chinese Poker. It can also be played as a Live Dealer variant at some casinos. Here, you play against a human croupier directing the action from a live casino setting or studio. Pai Gow is played between you and the dealer. 53 cards are used (a standard deck of cards plus one joker). Both you and the dealer are dealt seven cards. With these you have to form two poker hands, one with five cards and one 2-card hand. The five-card hand is the 'High', and the 2-card hand the 'Low'. The Low can never be better than the high hand. For example, you wouldn't be able to have a pair of sixes in the High and a pair of sevens in the Low. For the Low Hand, the best hand is a pair of aces, then kings, queens, jacks, etc. If you don't have a pair, the value goes on the quality of the high card. So, A-K would be the best non-pair hand, followed by A-Q, A-J, and so on. 3-2 is the worst Low hand. Placing Bets: To kick things off, you need to place a bet. The area is clearly displayed on-screen; just drag the chips to the spot to place a bet. You can also place an additional 'bonus' bet. Bonus payouts (see below) are paid immediately if you've hit three-of-a-kind or better. Now, you need to divide your cards into two hands. Select the two cards you want to form your Low and the five you want to form your High. You can also decide to click on the 'House Way' option if you like. This allows the casino to automatically split your hands the best way possible. To win, BOTH your hands must be better than the Dealer's. If just one of your hands beats the Dealer's, your bet 'pushes' and is saved to the next hand. If the Dealer beats both your hands you lose. Using the Joker: If you get the Joker, you can use this to substitute for any other card in the deck. However, it can only be used to form a straight, flush, straight flush, or Royal Flush. If you don't, it will count as an ace. Payouts: If you beat the Dealer's hands, you win even-money, or 1/1. However, there's a 5 percent cut (commission) taken from any payout. This is the house's edge over the player. In effect, the real payout is 19/20. Immediately you have a strong pair. You place the pair in the High hand, and the two highest single cards in your Low Hand. There are no flushes or straights out there, and you want to save the ace to make a high Low. The dealer turns over his cards and he has garbage. He has As-Ks-10s-8c-7s-5c-4h. The dealer is obliged to play the 'House Way', which is the set optimum way of 'setting', or arranging his cards. In fact, he has a 'Pai Gow' hand, a hand that contains no pairs. He can't even make a flush with his four spades. He is forced to play the two highest cards in his five-card hand. The player manages to beat both the High and Low, and wins the bet. As you only win of BOTH your hands win, it's important to split your cards the right way. It's important to balance your cards between the two hands. Players often go for a very strong five-card hand and forget all about their two-card hand. But you have to remember that BOTH hands need to beat the dealer to win. Make sure your Low contains an ace unless it's being used to form a straight flush or other bonus hand. A full house is a great hand in poker, but in Pai Gow it can get you into trouble. A full house is a very particular hand, and makes a great 5-card hand. However, it will leave your Low Hand very exposed. It's better to split the 3-of-a-kind and pair into the High and Low and hope to beat the Dealer that way. The House Way is the optimum strategy for that hand. In a land-based casino you can ask the Dealer for advice. Online, just click the House Way button and the software will split your cards the best way possible.